101 is the earliest appearance of the art name 篁子生, Kou-shi-sei as part of an edition I woodblock print signature in the main Rakusan sequence. 101 is also the only main sequence edition I print where Rakusan did not somewhere use his primary art name, 楽山, Raku-zan. Indentification of this design as number 101 is original to Rakusan who designated this woodblock print as the 101st design published in his main sequence. In doing so Rakusan chose to continue his consecutive numbering system used for the preceding 100 Series. However, 101 is actually the first of thirty-six woodblock prints in Rakusan's second main sequence series, 篁子生画選, Koushisei Gasen, lit. 'Koushisei's Print Selection' (usually called here the 36 Series). The woodblock print of 101 was adapted from one of a pair of actual-size original paintings on silk created in 1933. All of the original prototype paintings for this series are currently in a single private collection. 101 was the first of a contemporaneous early group of six 36 Series designs initially created within the last half of 1933. Edition I reprintings of 101 continued at least through 1936, and probably for several more years after that. The copy illustrated above is typical of edition I (except that it has a later-added city-name stamp in the lower left corner). 101 is one of only a few exceptional 36 Series designs reprinted in a very small edition II distinguished by different attribution markings. The scarcity of edition II copies of 101 suggests that only a single print run was ever made. Unfortunately, the time of transition from edition I to later edition II markings is uncertain. If edition II of 101 was produced shortly before the war, then there would have been no postwar reprintings of 101; and an individual loose copy of 101 with edition I markings only has a potential dating range of 1933-1941. Alternatively, if edition II of 101 was produced only after the war, then post-war edition I copies of 101 reprinted sometime during 1948-1955 are also possible. 36 Series prints were originally delivered tipped into recessed wells of presentation sheets which are embossed in their lower margins with the series title, 篁子生画選, Koushisei Gasen. Because all early edition I prints once had these presentation sheets, a copy which retains its presentation sheet must have been printed during the 1930s. After his supply of presentation sheets was exhausted, Rakusan distributed subsequently-reprinted copies loose. A limited number of leftover earlier-printed copies of some designs on presentation sheets were still being distributed shortly after World War II, but by then most designs were only available as loose sheets. Absence of presentation sheets is not diagnostic of later reprintings because many early prints have subsequently been detached from theirs. The 篁子生画選, Koushisei Gasen, project actually produced two distinct series of related woodblock prints. Each print of the 36 Series is intimately connected to a group of prints with the same subjects in the Fan Series. Together these subject-related prints constitute a theme, 画題, gadai. The theme is labeled here by the original Rakusan number of its 36 Series design followed by the subject name. 101 is the 36 Series design of the 101 Rose theme. Each theme typically consists of a quintet of monochrome Fan Series designs (one design in each of the five fan shapes), plus one polychrome 36 Series design which illustrates the theme subject. However, the 101 Rose theme is irregular in both its history and its composition. When Rakusan was experimenting with designs which would become the Fan Series and the 36 Series, he had originally thought to have multiple themes with the same general subjects. He began by creating and carving a few representative designs from each of those themes he intended to publish first. Rakusan carved six Fan Series rose designs divided among two planned rose themes, and he also created two original prototype paintings of roses intended as models for their 36 Series designs. Then Rakusan changed his mind. 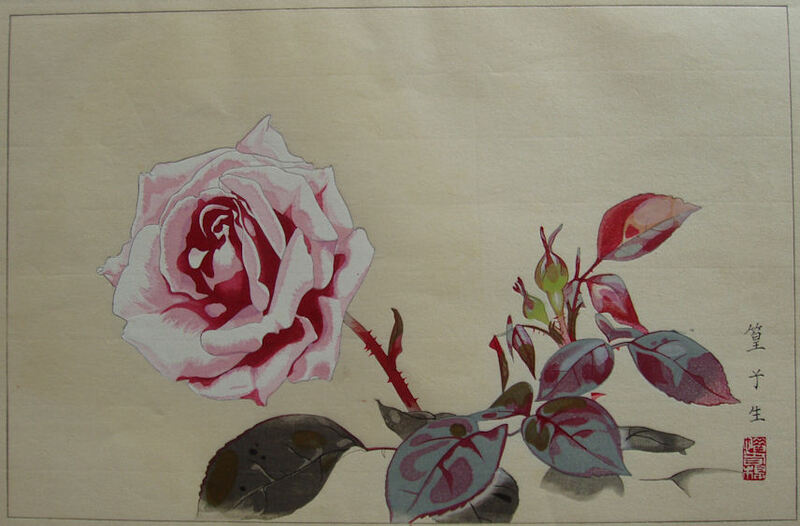 Not wanting to waste his previous efforts, he combined these two incomplete rose themes into one. The resultant 101 Rose theme has one Fan Series design of each of fan shapes 1, 2, 4, and 5; and two designs with fan shape 3. (Although it appears to be a regular fan quintet with an extra design 3, this is probably coincidental, and both early groups were likely incomplete.) Because these designs are in different styles; other than the designs which duplicate fan shape 3, the others can no longer be reliably re-separated into two original groups. One painting became the model for 101, but the other was never made into a woodblock print. The second design is the the only example of an unused painting in this series. The 36 Series design 101, and all six Fan Series designs in the 101 Rose theme have seal A and were all created and carved approximately in the third quarter of 1933. According to the Fan Series delivery documents for installment one, the woodblock prints of the 101 Rose theme were printed in January 1934 and distributed January 20, 1934 in the first delivery, installment one (of twelve). There Rakusan used the theme title 薔薇, bara, 'rose', which was also the title of the 36 Series design 101 published at the same time. Installment one has two irregular themes. Because of the merger, the 101 Rose theme has six Fan Series designs. The following 102 Iris theme was also the result of a similar early merger of two groups but ended up with only the original four Fan Series designs to offset the excess in the 101 Rose theme. The remainder of the installment quota of fifteen Fan Series designs in three themes came from the five designs in the perfectly regular quintet of the 103 Tree-peony theme. At least some of the designs in the 101 Rose theme were adapted from rose sketches originally created in the late 1920s during the planning of design 7 in the earlier 100 Series (see below).